Built 1949 by Ing. Livio Dante Porta & Co. Ltd. Many thanks for your fax received just 10 min ago. The correct name is 'ARGENTINA' , not 'LA ARGENTINA'........"
'Argentina' was not a new build locomotive rather it was a rebuild of a metre gauge locomotive, ex- FC* Central Córdoba class B22 4-6-2 No.2011. That said major components such as the boiler were new. Structural and thermodynamic improvements were incorporated into the rebuilt locomotive along with a striking streamlined external appearance inspired by locomotives built in USA, UK and France. 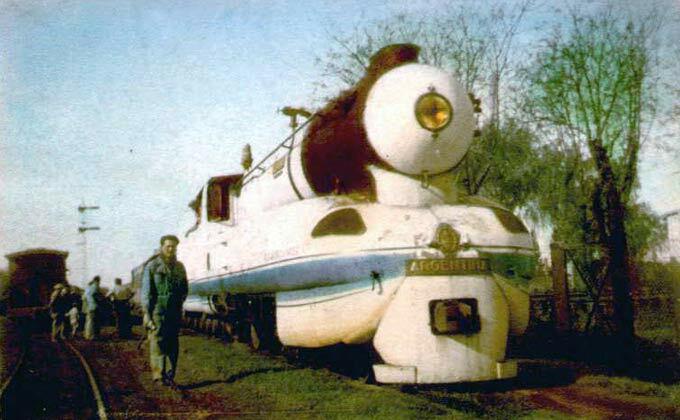 This was the first locomotive project undertaken by the now world famous Argentine locomotive engineer Livio Dante Porta who was just 27 years of age when the locomotive first ran. During his life (1922-2003) Porta was responsible for many substantial improvements in all round performance on many steam locomotives operating all over the world. ‘Argentina’ was nothing short of exceptional, even more so when it is remembered this was Porta's first attempt, and remains one of the most efficient steam railway locomotives of all time. A class B22 photographed circa 1955 by Arnold Reid. Courtesy Luis Gutierrez. Prior to the work commencing funding had to be secured. 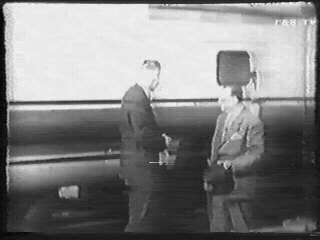 This funding came entirely from BANADE (Argentine National State Bank) but not before Porta had personally met with Argentine President Perón. Politically it was the right project at the right time. Perón was interested in projects which broke new ground technologically, Porta's ‘Argentina’ fitted the bill perfectly. In order to carry out the rebuilding No.2011 was transferred to Ing. Livio Dante Porta & Co. Ltd.’s workshops at Puerto de Rosario (Port of Rosario), Santa Fe province, in 1948. 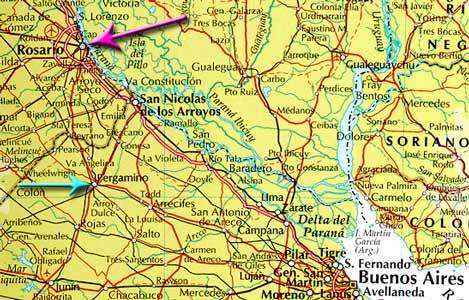 Rosario is approximately 300km north west of the Argentine capital Buenos Aires. In addition to Porta the other engineers involved in the rebuilding work were Gino Margutti, Adolfo P. Allegri, Raymundo Falardo and Miguel Egulazu. The map on the left shows where Rosario is in relation to Buenos Aires and also the location of Pergamino refereed to later. 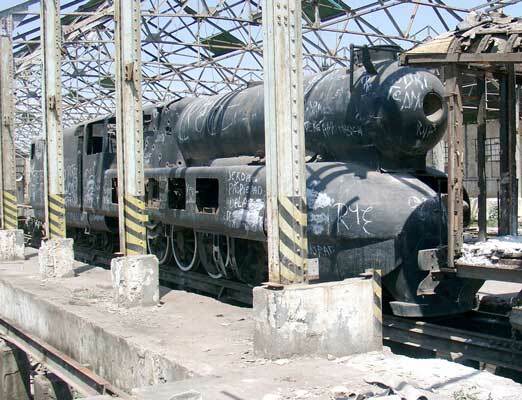 At Rosario No.2011 was transformed into something very different to that which it had previously been and something radically different to any standard Argentine locomotive. In some ways the rebuilding can be seen as more of "an accounts" rebuilding, that is many of the major components were totally replaced. No.2011 ended up contributing little more than wheelsets, sections of the frames and the tender to the finished product. The rebuilding transformed the locomotive into a 4 cylinder compound 4-8-0 locomotive with a twin axle bogie tender. 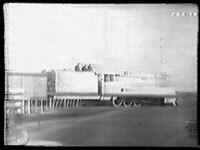 The locomotive was arranged with the 2 high pressure cylinders, 360mm diameter by 660mm stroke, (approximately 14¼” x 26”) between the frames and 2 low pressure cylinders, 580mm diameter by 560mm stroke, (approximately 23” x 22”) outside the frames. 'Argentina' outside the workshop in which she was constructed at Rosario in 1948 or 1949. This is the only section of the locomotive's General Arrangement diagram currently available. It poses almost as many questions as it answers! 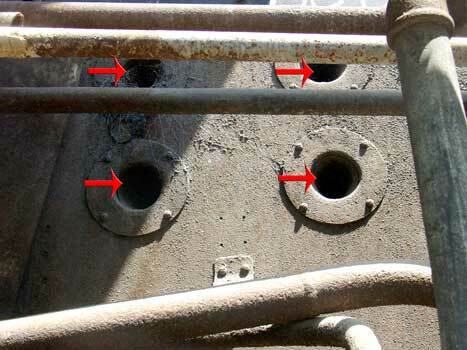 The cross sectional area of the steam ports was increased to 25% of the piston area to lower the pressure drop, and thus reduce energy wastage to a minimum and to improve the freedom of the steam flow. All the steam passages were enlarged considerably; they were made larger than had been recommended by the eminent French locomotive engineer André Chapelon who had so inspired Porta. With some of the construction team present the almost finished locomotive is again seen outside the workshop. 1949. 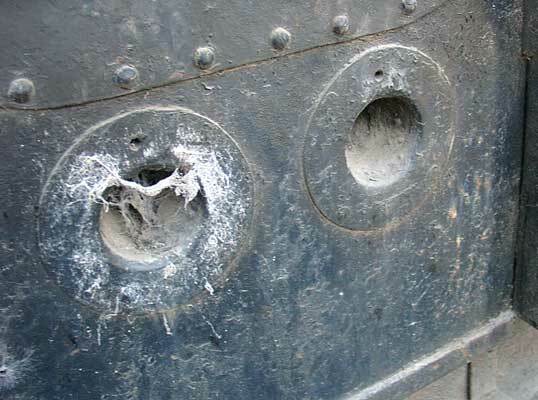 The new boiler was of all welded construction with the exception of the main barrel seam which was riveted. No flanging was required for this totally handmade boiler thus saving considerable sums in the construction. In the firebox five 'T' security circulators where fitted with the lengthy brick arch sitting on top of the four front most circulators. 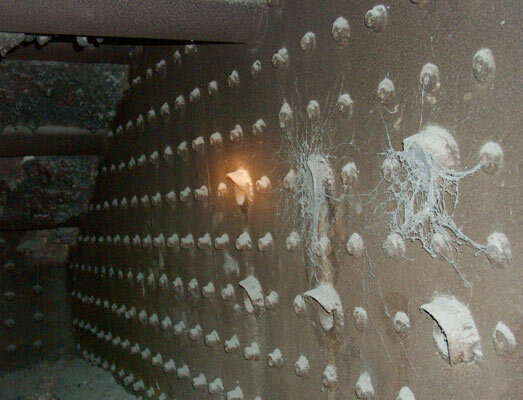 The boiler pressure was 285psi with a sizeable superheater delivering steam at 450°C. Between the high and low pressure cylinders, along the lines of Chapelon’s experimental 2-12-0 160A1, re-superheating was employed ensuring the receiver steam temperature could reach 317°C. 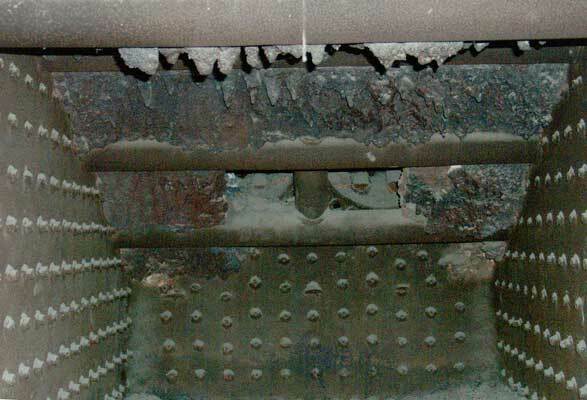 The firebox sat entirely above the frames and was equipped with a fully rocking grate. It was arranged to give a deep firebed and a large proportion of combustion air was admitted over the fire. 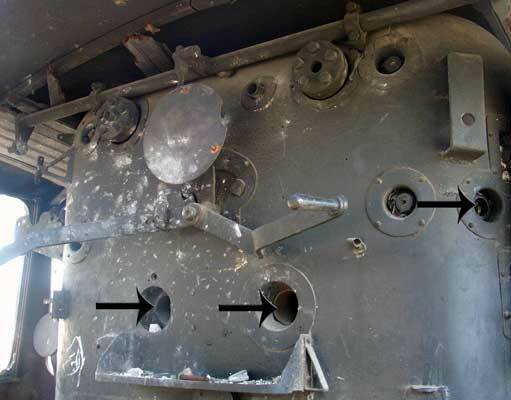 Low down on each side of the firebox six secondary (over-fire) air holes were fitted with two higher up on each side and eight at various levels on the backhead. 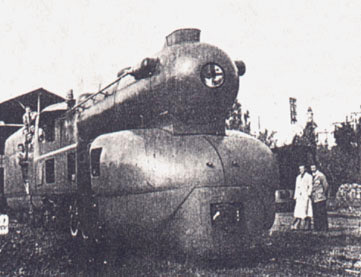 Thus ‘Argentina’ became the first locomotive to have a basic Gas Producer Combustion System (GPCS). 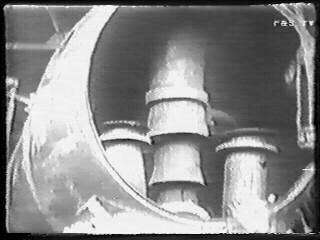 In the smokebox the exhaust system was a Kylchap which provided a good strong draught. 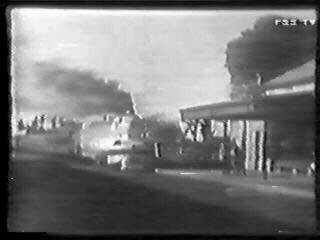 Despite this little fire lifting was noted which can be attributed to the basic GPCS system in use. Whilst many trains still ran without continuous brakes Porta made sure the loco was ready for the future by fitting air brakes to the loco. As with all the other kit on the loco initially the pump was hidden behind the shrouding above the wheels. Tractive Effort: It is most unusual to see a tractive effort (TE) figure quoted for any form of compound steam locomotive. In many regards it is a fairly meaningless measure of power. It says little about a locomotive's true haulage abilities.  However to provide a comparison with other locomotives I have calculated an approximate TE figure for 'Argentina' based on the formulæ given by E.A.Phillipson. TE: 243kN which is equivalent to 54635lbs. To see my justification of this figure click here. Construction costs were lower than for any locomotive of equivalent power despite ‘Argentina’ being experimental. 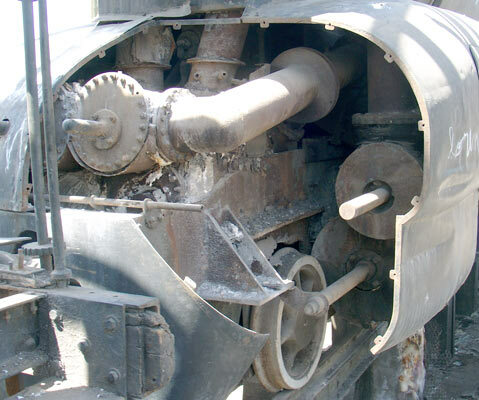 This can largely be attributed to the extensive use of welded mild steel plate in many areas such as the pistons, cylinders, streamlined casing, tender tank extension on top of the original tender and axleboxes. "Mejor que decir es hacer" - "Better to do than to say"
"Mejor que prometer es realizar" - "Better to carry out than to promise"
'Argentina' was painted in the colours of the Argentine flag - white and sky blue. Unusually for a steam locomotive the bulk of the machine was painted white with one broad blue band and two narrower ones low down on each side. Early photographs of the locomotive show her to have had a white smokebox and smokebox door. 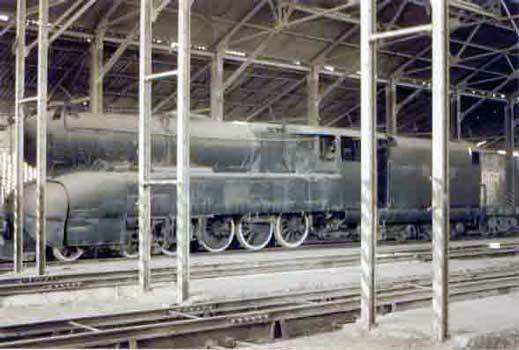 Later photographs show first the smokebox, then the smokebox door, painted black. The webmaster is unaware of any number 'Argentina' may have carried in service. The initial commissioning was carried out on the Puerto de Rosario railway system and in the Rosario area on the ex FC Central Cordoba routes then, as now, under the control of the FC General Belgrano (FCGB) as are all the metre gauge routes in this part of Argentina. 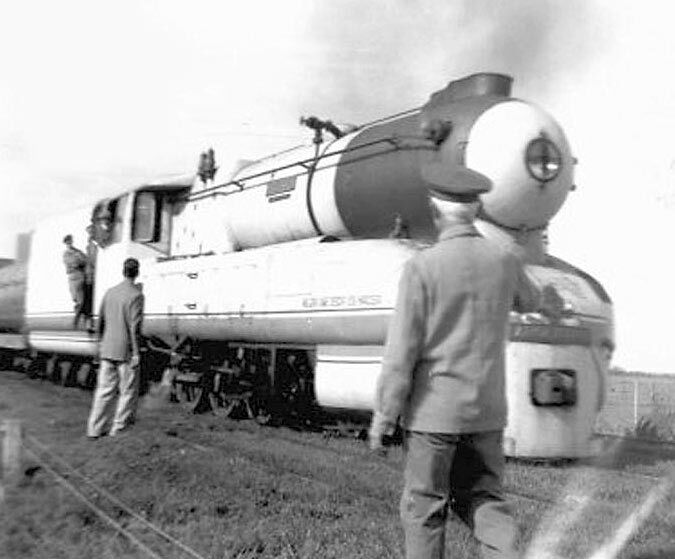 Once initial teething problems, mainly concerning steam leakage, had been solved she was transferred to the routes of the one time FC Provincial de Buenos Aires (again then, as now, FCGB) for thorough road testing. For this move from Rosario, over the route of the once French owned Compagnie Général des Chemins de Fer de la Province de Buenos Aires, Porta himself drove. 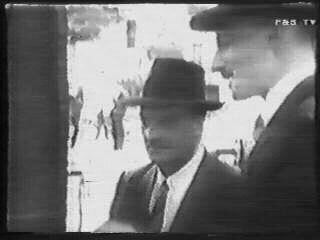 Also present were Francisco Besio and Carlos Ramos. 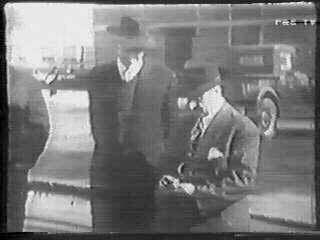 Leaving on a Saturday a stop was made at Pergamino station to carry out inspections and cleaning. They set off again on the following Tuesday for La Plata crossing onto former FC Provincial de Buenos Aires metals in the Buenos Aires area. The 10am arrival at La Plata station aroused local interest. Those present including the interim director of the area’s railway, Sr. Guillermo Martinengo, together with other officials from the department and members of the public. La Plata is approximately 60km from Buenos Aires. 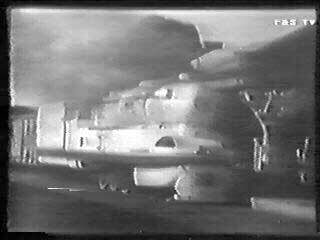 'Argentina' whilst on test. 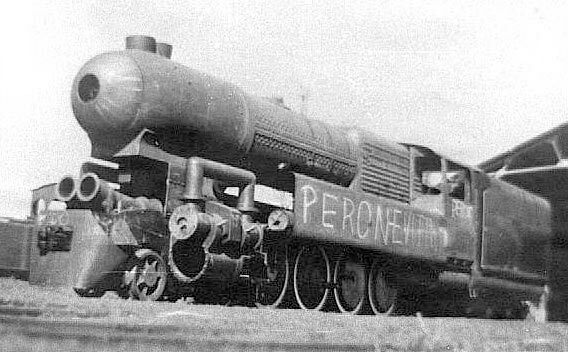 The 'Presidente Perón' nameplates are clearly visible on the boiler side. 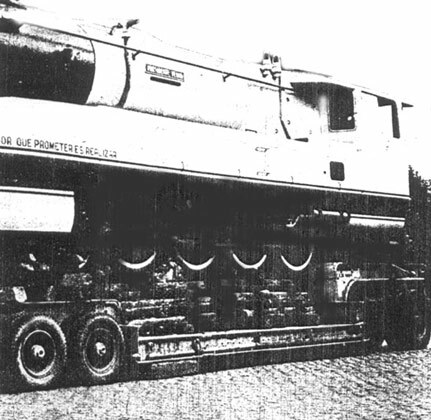 The transformed locomotive was able to produce of 1581 drawbar kW (2100 dbhp), this being far higher than No.2011 was capable of. 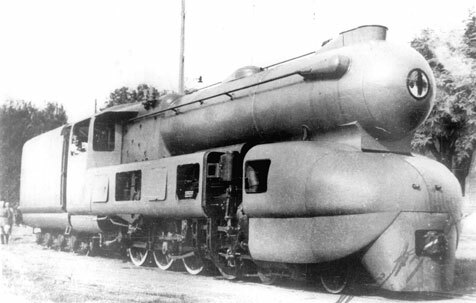 Another outstanding characteristic was her high power to weight ratio 23.2 kN/metric ton (31 dbhp/ton) thus equalling the best in the world – the Chapelon designed SNCF 4-8-0 240P class. Interestingly the 240Ps, and their predecessors the 240.7xx class, were also rebuilds from a 4-6-2 type, the Paris-Orleans Railway 4500 class. The 4500's were the very first Pacifics built in Europe. Fuel consumption was greatly reduced, on test it was established as being approximately 50% less than other locomotives of similar power; similarly the water consumption was much lower. When burning coal with a calorific value of 28 MJ/kg the drawbar specific fuel consumption was 0.3 kg/MJ. This amounted to a world record drawbar thermal efficiency of 11.9%. Interestingly this figure was produced at a sub-optimal point. It has been estimated drawbar thermal efficiency would have risen to 13% if it had been measured at a power and speed corresponding to the maximum drawbar thermal efficiency. This interesting graph shows relative thermal efficiencies of the better performing first generation steam locomotives. This graph has been taken from a French publication partly explaining the reference to French locomotives. This is also explained by the fact that prior to Porta's work the machines of Chapelon had the highest thermal efficiency of any locos. This graph, however, needs to be accompanied by a 'health warning'. Firstly it is uncertain if the quoted thermal efficiencies are actually valid for comparison. Secondly the efficiency of FCGB 240-11C seems to be HIGHLY suspect. The Chapelon modified 11C was nowhere near the advanced level reached by 'Argentina'. No details to back up the claimed efficiency have yet been uncovered. 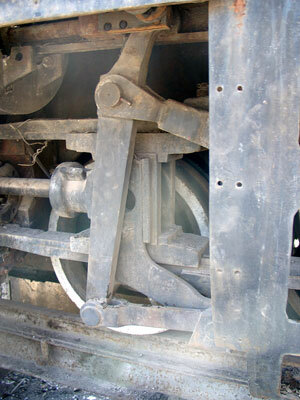 Also note wheel arrangements are quoted using the French notation so a 2-4-0 under the Whyte scheme is a 4-8-0 etc. 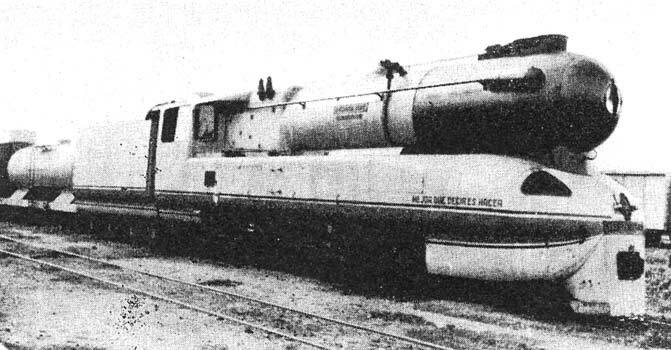 Source: Thermodynamique et locomotives à vapeur. B. Escudié, J. Gréa & J-M. Combe. CNRS, 1989. *estimated drawbar thermal efficiency would have risen to 13% if it had been measured at a power and speed corresponding to the maximum drawbar thermal efficiency. 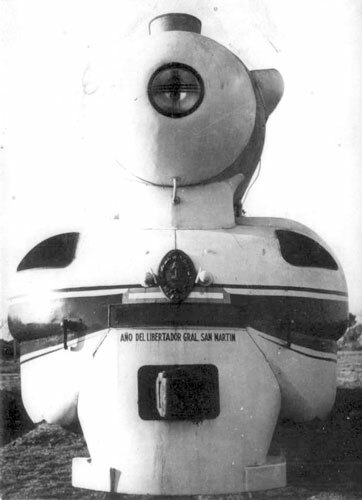 This photograph of 'Argentina' appears in Porta's 1969 I.Mech.E paper. 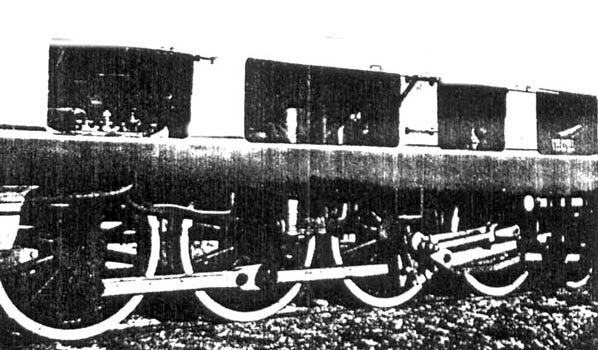 It was simply captioned thus: "Prototype metre-gauge 4-cylinder compound 4-8-0 locomotive." Her smaller dimensions, lower weight and greater efficiency than other locomotives of the same horsepower meant she was able undertake very similar duties. It also meant repairs could be carried out in smaller workshops, whilst the axleloading avoided the need to increase the strength of the permanent way. In recent years visitors to FCAF in Ushuaia have included several firemen who well remember 'Argentina'. Only good things are said about the locomotive and its abilities. It is reported that on several occasions Porta had fierce arguments with the railway authorities over the locomotive's ability to haul trains which were considered to be vastly too heavy. This led to Porta finally arranging for the locomotive to be heavily "overloaded" to prove his point, which of course he and 'Argentina' did. 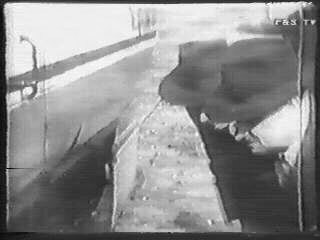 On another occasion, with a skeptical footplate inspector on board, he stopped the locomotive on a gradient so steep it was deemed impossible to start from made worse, again, by the locomotive being "overloaded" according to said inspector. 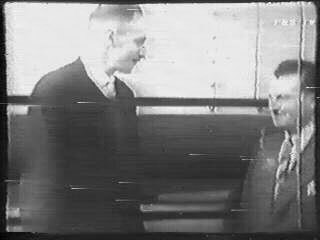 'Argentina' restarted the train with no problems and the inspector was left somewhat "red faced"! Originally this was a black and white photo. As was common at the time the colours have been added afterwards by an artist. 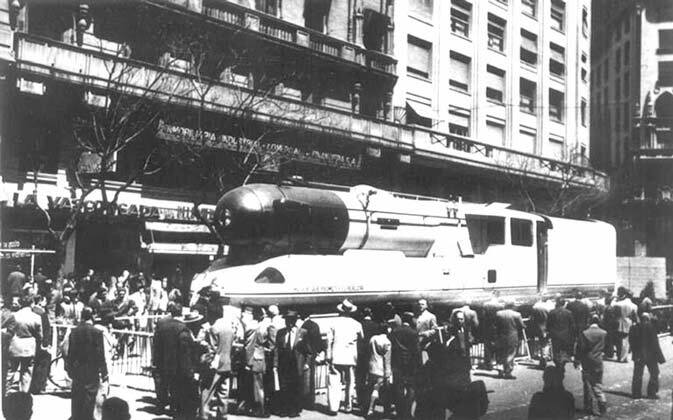 Once testing had finished the locomotive was taken for display in central Buenos Aires on a trailer towed by horses. Porta and wife Ana camped out with the locomotive overnight to deter thieves. 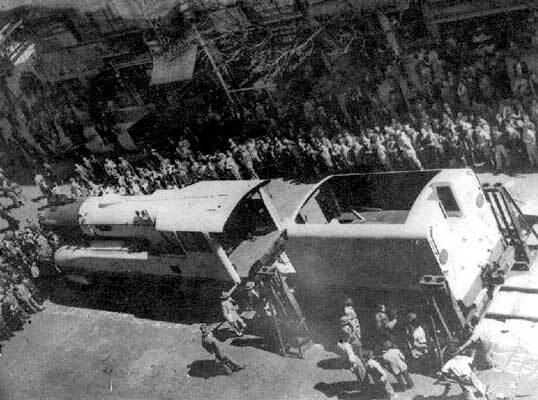 The locomotive was exhibited on Roque Saenz Peña avenue between its intersections with Bartolomé Mitre and Florida streets. Interestingly for this exhibition the 'Argentina' plate was removed from the front of the loco and replaced by yet another 'Presidente Perón'. 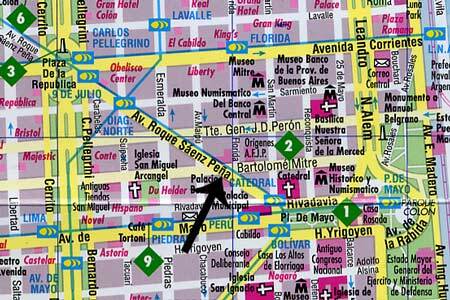 The black arrow points to where 'Argentina' was displayed in Buenos Aires. On a low loader either going to or from exhibition in Buenos Aires. 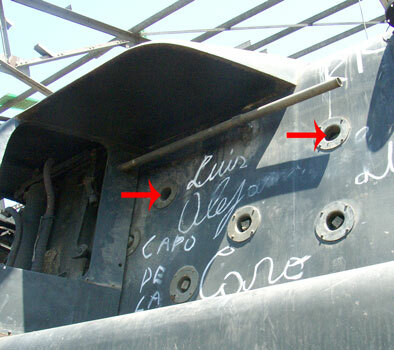 Note the Peron inscription on the casing over the cylinder and the Presidente Peron nameplate on the boiler. Large crowds witness the preparation for display of 'Argentina'. Note the jacks used for unloading and the roomy cab. 'Argentina' on display in Buenos Aires. This is the same location that Argentina was displayed but viewed in 2004. 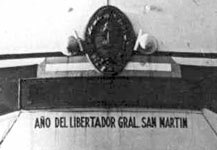 Photographs from 1950 show the locomotive bearing an additional slogan on the front end - 'AÑO DEL LIBERTADOR GRAL SAN MARTIN' - celebrating the centenary of one of Argentina's important historical figures. 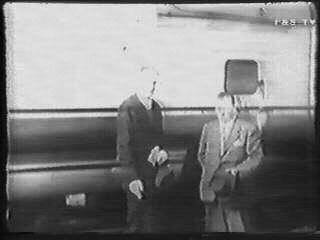 Peron lost power in 1955 after which the locomotive lost all the 'Presidente Perón' nameplates. At this point the locomotive gained two more 'Argentina' plates and remained with these until withdrawn. Once testing, exhibiting and related work was completed 'Argentina' was used exclusively for goods trains on the FCGB. 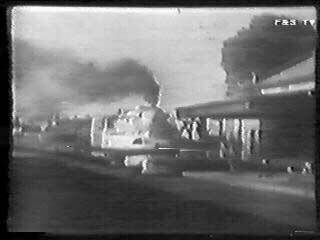 This continued until the early 1960s seeing the locomotive mainly operating on the lines to Mira Pampa and Olayarría to the south west of Buenos Aires. When these were closed ‘Argentina’s’ time was about up. Around 1961, having run approximately 70000km the locomotive was taken out of active service and dumped at La Plata depot, where she remained until the mid 1970's. An interesting view showing the motion and the raised access panels which were later removed entirely to make access easier. 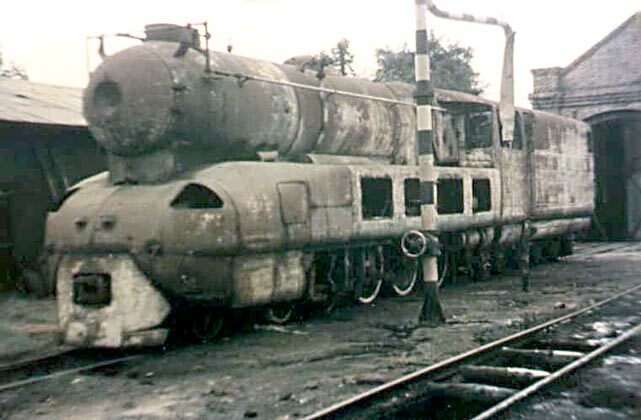 Having been withdrawn 'Argentina' was dumped at La Plata depot. Date Unknown. 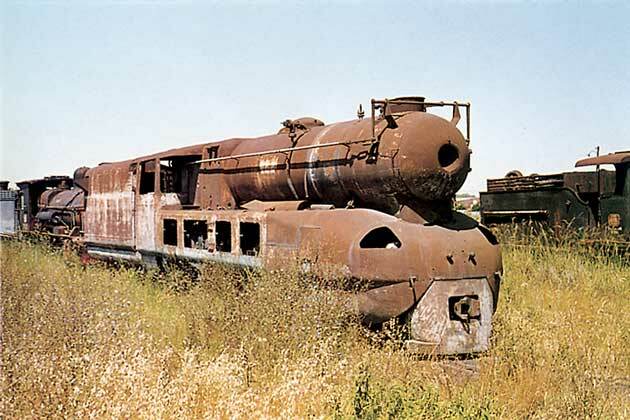 Another view of the locomotive dumped at La Plata this time in 1973. © David Wardale. There is a little confusion over the precise dates but at some point she was taken to Tapiales workshops near Buenos Aires and thence to the workshops at Tafí Viejo in Tucumán Province for safe storage prior to entering a then planned transport museum. Interestingly this move occurred around the time Perón briefly returned to power in Argentina. The locomotive remained there until a cultural initiative in Tucumán city (1312 km north west of Buenos Aires, the full name being San Miguel de Tucumán) turned the FCGB Norte railway station into a Transport Museum in 1996. 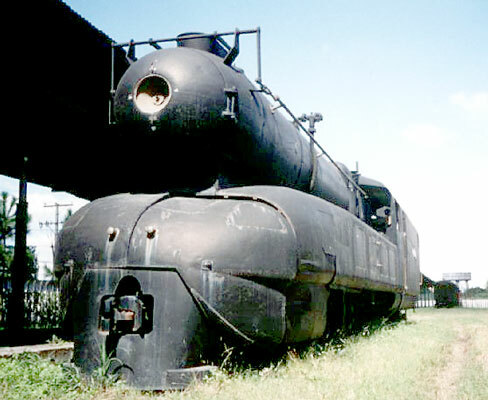 The museum contained several locomotives and vehicles from the Tafí Viejo line but the real star was Porta's locomotive. For exhibition she was repainted in a leaden grey colour and placed on exhibition with passenger coaches from the Tafí Viejo line alongside the main platform. A view of 'Argentina' on display at the FC General Belgrano station in Tucumán. 2000. © Lic. Mária Angélica Páez Zigarán, courtesy of Shaun McMahon. Finalising the design of the Lemprex type exhaust system and fitting. Would of course have included the addition of a Kordina. Full implementation of the Gas Producer Combustion System. All round improvement to the valve design to bring up to the latest standards including better liners. New throttle valve design to overcome one of the remaining weak links in the original design. Throttle handle and linkage to be totally redesigned. As built the throttle rod passed down the centre line of the boiler. This was to be altered to a pull out type throttle handle (of the RFIRT type) with the operating linkage being external to the boiler, a fundamental requirement of modern internal boiler water treatment. A better reverser - based on the RFIRT type. New axles on all wheelsets to conform to current best practice. High adhesion tyre profile, drawing on recent design enhancements made with Minaz 1816 in Cuba. 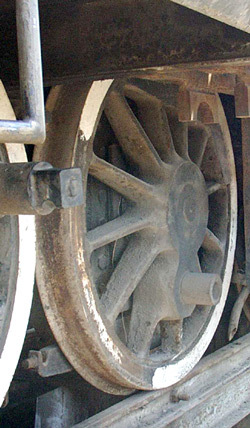 Naturally to include the main driven wheels being turned to a larger diameter than the other driven wheels. 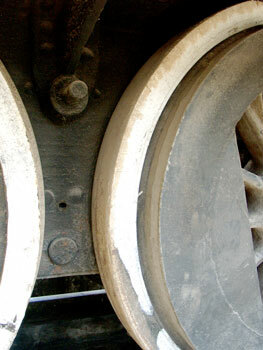 Enhanced tread steering on the driving wheels. Addition of feedwater heating, of the closed type. A change from top feed to submerged water feed so as to conform with the requirements of 'Porta Treatment'. Fitting a foam height meter as a driving aid. Improved and extended mechanical lubrication. Considerably enhanced all round insulation. Turning the locomotive into a working machine rather than an experimental machine. This was to include far better access for maintenance, a major problem with the locomotive as built. Clearly this would necessitate alterations in appearance. Steam or air operated auxiliaries, where appropriate operated from foot pedals. Totally redesigned and most probably considerably enlarged tender. The small tender was acknowledged by Porta as being one of the locomotive's weaknesses. 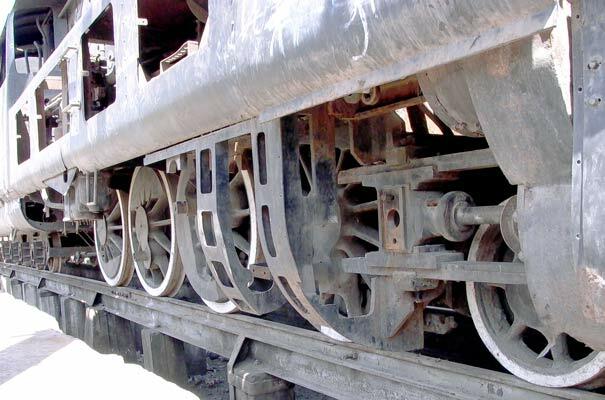 The tender bogies were to have been of the tread steering type as developed on the Alfred Country Railway in South Africa. To practice what he preached about engineers being too proud to say that they had not reached their high point with one design. He wanted 'Argentina' to be a practical example of this and break that mould by showing people that he was not too proud to admit that he did not know very much at the age of 27 and had learnt more by age the of 78. To provide a working example of much of his latest thinking so as to educate and provide practical experience for all those willing to learn what a steam locomotive could be in the 21st century. 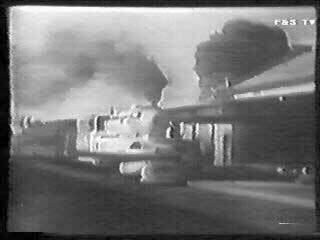 As a first step towards raising the necessary finance a video was produced showing the locomotive in action. This is still available via Hr. G.Haslbeck in Germany. Each copy on VHS (PAL) costs €15+postage. Hr. Haslbeck be contacted by clicking here. The price quoted is as for late 2004 and may change. Sadly, soon after this plan was hatched the serious economic crash of 2001 occurred. This effectively ended this very interesting and important project almost before it had had time to start. 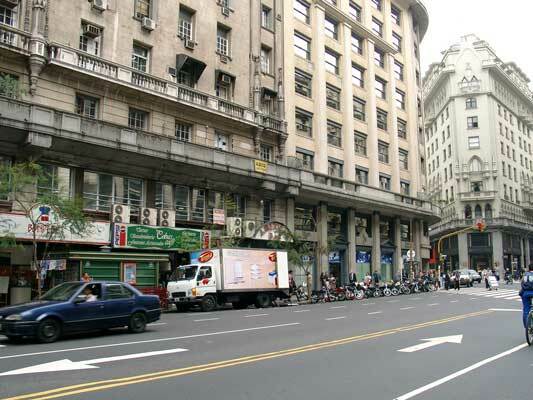 Changes have also occurred in Tucumán since the problems of 2001. 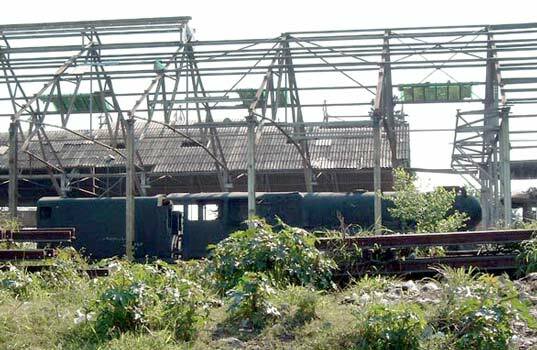 The museum has closed, the station has found new uses but has not been been demolished as has been reported. In May 2004 'Argentina' was quoted as being at the now closed FCGB Tucumán depot of Mate de Luna a short distance from the site of the museum. 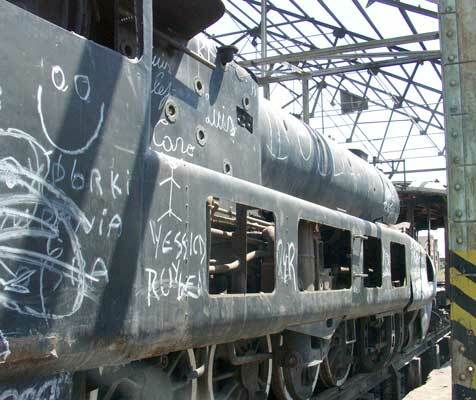 A small group of enthusiasts and other interested people visited Mate de Luna depot, Tucumán, on October 14 2004. The area is not the safest part of Tucumán so only a short time with the locomotive was possible. 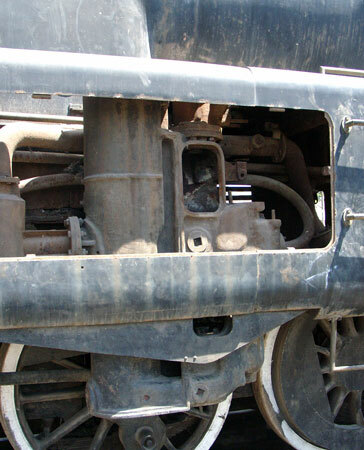 Since the photograph taken in 2003 many easy to remove parts have been stolen, presumably being sold for scrap. This visit was no mere pilgrimage. Rather it acted as an opportunity to assess the locomotive and area for removal from the site by road in due course. 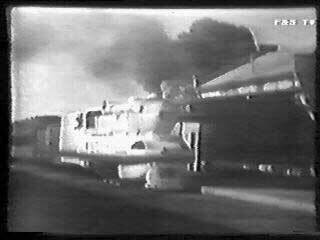 It was intended to give the locomotive a secure future however, ultimately, this effort was thwarted. 'Argentina' was lost to the world. * FC is the Argentine abbreviation for Ferrocarril which means Railway. "The Red Devil and Other Tales from the Age of Steam" by David Wardale. Published 1998. "La Locomotive a Vapeur" by Andre Chapelon, 2nd Edition translated into English by George Carpenter. Published 2000. "La Argentina" By Juan Carlos Gonzalez. Published online. Translated by C.A.Fox, Río Gallegos, May 2004, e-mail: translations @ traduzcaike dot com. "Steam Locomotive Development in Argentina - Its Contribution to the Future of Railway Technology in the Under-Developed Counties" by L.D.Porta - I.MECH.E Paper No.721, 7th March 1969. "Steam Locomotive Design: Data and Formulæ" by E.A. Phillipson. Published 1936, reprinted 2004. Written correspondence with Shaun McMahon, 2003/2004. Notes taken in conversation with Shaun McMahon, 2004. Conversation with Adam Harris, 2004. "The Railways of South America" by D. Trevor Rowe. Published 2000. "The Ultimate Steam Page" by Hugh Odom. Website. W.Banfield, O.A.Boichetta, R.Campbell, K.Findlay, C.A.Fox, J.C.Gonzalez, L.Gutierrez, P.Keen, S.McMahon, J.Nicolo, A.D.Porta, D.Wardale, E.Zarzoso.